Here is my project for the April theme. I just love frames, love customizing them to fit room decor, a certain theme or someone's personality. 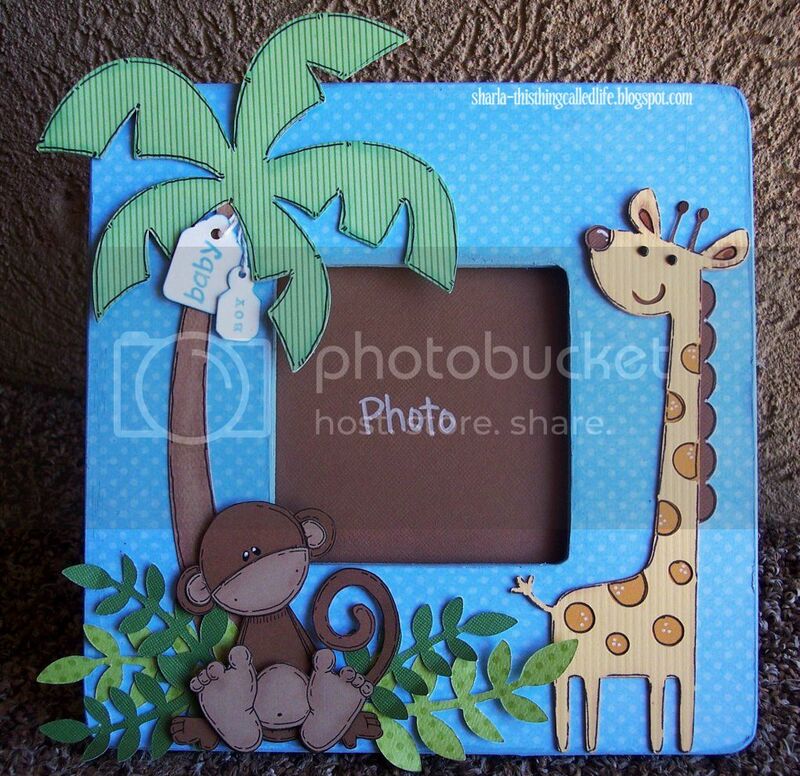 I made this card using the giraffe and palm tree from Create A Critter and my cricut, the monkey is a digi stamps from Meljen's called Monkey Toes. I adore this monkey!!! Please stop by Patches of Pink and check out the other DT members their projects are Awesome. Remember you can link up to 2 recent projects. The link up party will end May 9th @ 11.59pm EST. Be sure to link back to Patches of Pink from your projects and you can also grab the Patches of Pink Link-Up Button to help people find the link-up party! Adorable! !I have never altered a frame before. Great idea. Sharla, this is so ADORABLE! I love that monkey too. I LOVE those tags hanging from the tree! Great Job! Soooo super cute, Sharla!!! Love those little animals! Oh my goodness, this is the most adorable thing EVER! I love those tags hanging off the palm tree! Too freaking cute!!! This is So Super cute. I am so glad you came over and joined us. I love this little Monkey. Ohh, this frame is so cute!!!!. I monkeys on cards and stuff. I need to go buy some more of wooden frames to decorate hehehe. This is a wonderful project! I love your coloring! Thank you for participating in the Creative Belli Challenge.